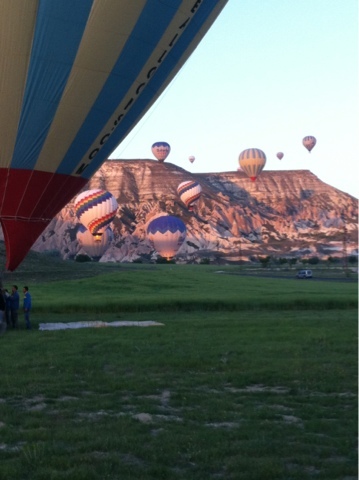 Cappadocia is one of Turkey's most popular tourist areas. The extraordinary rock formations are a result of layers of softer sandstone with harder layers of volcanic rock. Erosion has created weird shapes (Peter is a geologist and knows the proper word - Geomorphic). The best way to see the area is by balloon. So we were up early (4:30) to catch a sunrise flight. There were 70 other balloons with same idea so air space was a bit saturated. Bet it was amazing! Request from friends who are following your blog...can we see a picci of you with Tin Tin (my hubby)? !